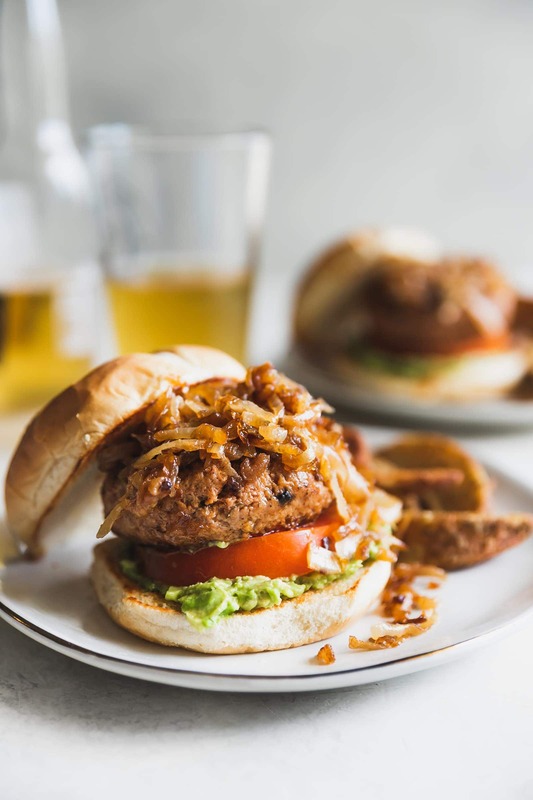 Tender, flavorful juicy turkey burgers made with the best seasoning then topped with mashed avocado, tomato and caramelized onions. Ok this is going to sound weird. The other day, I went to Cheesecake Factory and had the absolute BEST turkey burger I’ve ever eaten at a restaurant. Weird, right? Who orders that at Cheesecake Factory? I don’t usually order turkey burgers anywhere for that matter but I’m *really* trying to get my sh!t together when it comes to healthy, mindful eating so here we are. I went to Cheesecake Factory, got overwhelmed with the menu as per usual and then saw the turkey burger and ordered it. The End. ACTUALLY…I’m so lying to you. That’s all incorrect. I actually ordered the turkey avocado club. Wow, I just remembered that. I ordered the club and they brought out the burger by mistake. That’s what happened. Literally the server messed up. Rude. But no it’s cool. Because it’s what inspired today’s recipe. See guys, sometimes things happen for a reason. The burger did not have any condiments on it because I always ask for all that on the side. I have control issues, sue me. I added the mashed avocado to this mistake turkey burger and it was AMAZING. Maybe I was just really hungry. Either way, I enjoyed it and decided to make one for you guys! I think the best part of my mistake turkey burger was the fact that it had caramelized onions. Something I don’t usually see on turkey burgers. I love ordering caramelized onions on beef burgers with some goat cheese or mushrooms. YUM. I knew, for sure, caramelized onions had to be part of my recipe. Thing is… the main ingredient in caramelized onions is PATIENCE. Something I lack very much of. True story – I’ve burned so many onions trying to caramelize them. It’s ridiculous. But I’m a determined soul so I mastered it eventually. Hooray for me. This is what you need to know. You MUST go low and slow when caramelizing onions. Melt the butter, add the onions then rarely stir them around. And you do all of this at medium-low heat. Like literally my stove was like at 2 or 3. SO LOW. It took what seemed like forever but guess what? They didn’t burn. In the past, I would literally have the heat so high because I wanted this process to go faster. Of course, they burned. Remember, low and slow. It’s worth the wait, I promise. Also, you can store them in an airtight container in the fridge for up to 1 week. 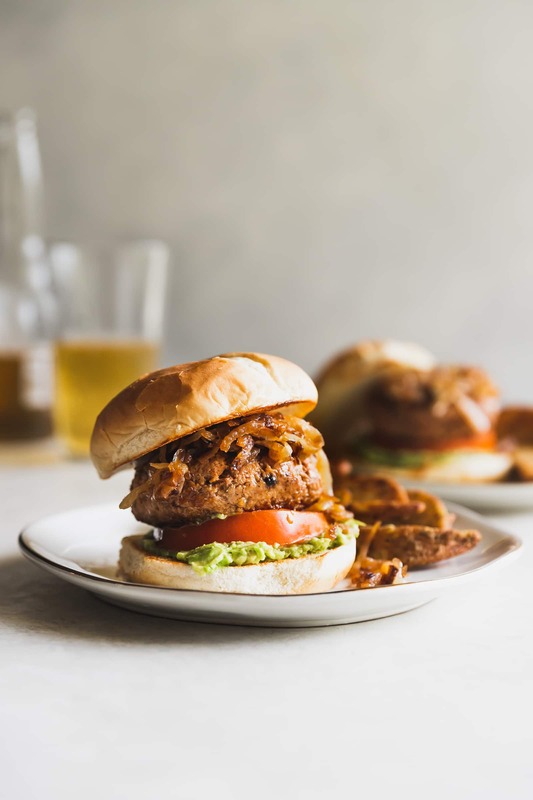 Yes, these turkey burgers are tender and juicy! Listen. Ground turkey is bland, boring, and dry. Like I don’t understand how people can eat it without seasoning it. I made sure these turkey burgers were flavorful AF. I added all my favorite spices, tomato paste instead of ketchup and Worcestershire sauce to keep them nice and juicy. Making them is not hard at all. The only “hard part” of this recipe is waiting for those onions to caramelize. Honestly guys, you can’t take my word for it. 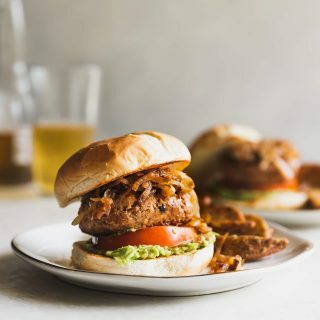 The combo of flavors with the caramelized onions, the avocado, and tomato just seals the deal here. Feel free to add mayo, a simple slaw or Boston lettuce to the party, if you wish. In the meantime, make the turkey burgers. In a bowl, add ground turkey, Worcestershire sauce, tomato paste, smoked paprika, garlic powder, oregano, cumin, salt and pepper. Mix together until well combined. Form ground turkey into 4 burger patties and place them in the fridge for 10 minutes to firm up a bit. In a hot skillet, add olive oil. Cook turkey patties on medium-high heat for 7 minutes on each side, or until cooked through. Transfer to a plate. To assemble, add mashed avocado on toasted buns, tomato slice, turkey burger, then top with caramelized onions. Serve and enjoy! *Caramelized onions can be kept in an airtight container in the fridge for up to 1 week.